Kids campus design with 5 "playparks"
As a campus for young children, this complex provides early education and care for over 400 in a wooded setting at the edge of a much larger research campus. 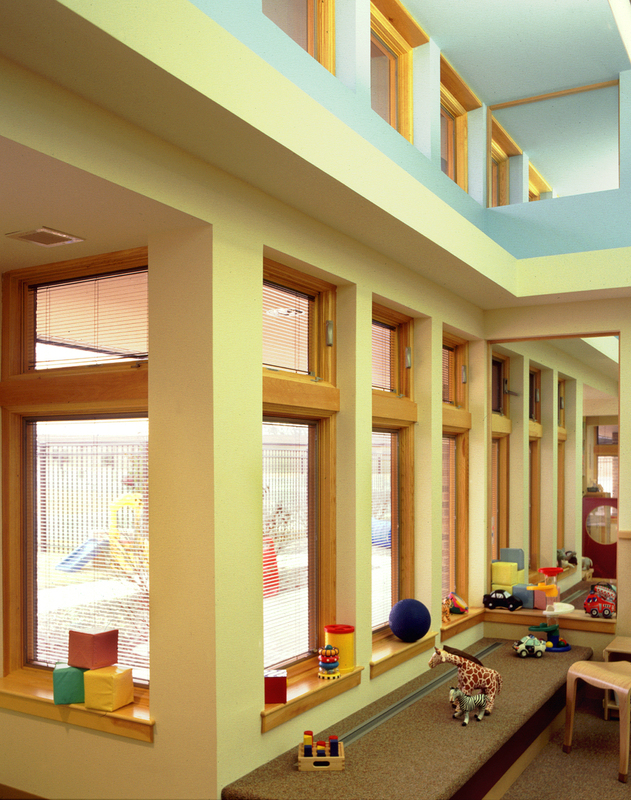 The building and grounds were designed in concert to create an optimal environment for the development of the children who range from infancy through school age. The 47,000 square foot building was broken into wings which create protected outdoor “playparks” with both fabricated and natural places and elements, fundamental to encouraging children to connect with the natural world. A primary consideration from the outset of design was the relatively enormous scale of this center with a program of 425 children. This design challenge was addressed by conceiving of the center as a campus for children and breaking down the building into four distinct wings that step with the gentle topography. Each of these wings comprises a “family group” with rooms designed for the full complement of age groups, infant through kindergarten and school-age. Siblings in each family spend their days in classrooms within one of these wings, so families and caregivers develop a sense of participating in a smaller community within the larger overall campus. These wings were carefully composed to define outdoor courtyards of significant size, allowing for generous playgrounds for children to roam, while still maintaining a sense of intimacy appropriate to the “family group.” By locating older and younger children on opposite sides of each wing, and then arranging wings so older and younger homerooms share frontage on common courtyards, D. W. Arthur Associates was able to maximize playground opportunities within the limited budget. Large, cloistered playparks are shared by adjacent banks of rooms, allowing for a larger “neighborhood” character to develop through intermingling between family groups. Special destination spaces, like the library, art studio, performance space, and an indoor active play area (with elaborate climbing structure and yoga area) are distributed throughout the complex. Children from each wing take “field trips” to these spaces which provide exposure to the greater scope of possibilities in their campus. These destinations also promote a sense of overall community, campus-wide. Beyond the immediate confines of the building and playgrounds, elements of the existing landscape - an old farm including a pond with bridge, apple orchard, and stands of mature hardwoods - are scheduled to be developed over time as enrichments to the more conventional child learning environments. Architecturally, the complex draws on Prairie Style influences such as low horizontal hip roofs and intersecting volumes with spaces flowing from interior to exterior. The language which was developed for the expression of the facades provides ample covered outdoor porches. 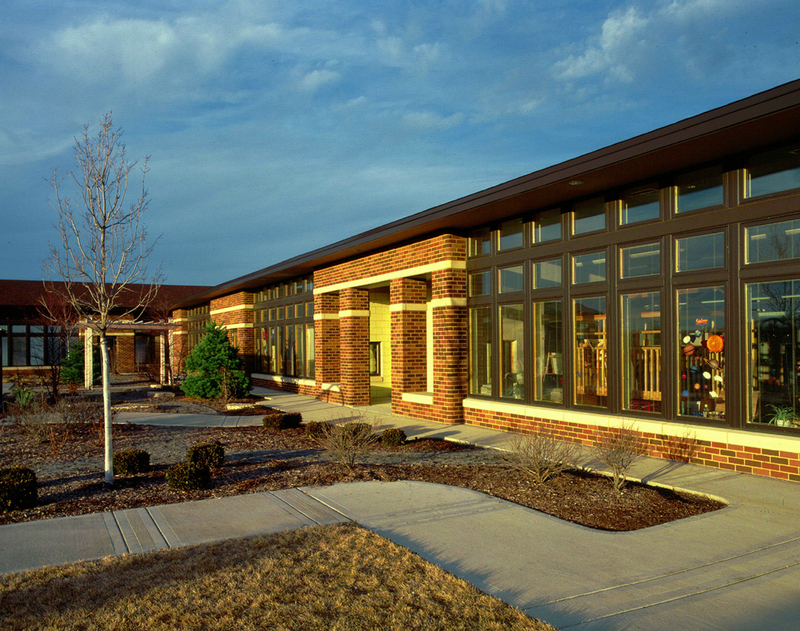 These are offset by clerestory windows above which admit abundant daylight into the classrooms. Brick wall cladding matches the bulk of the buildings on the campus.